Manage maintenance inventory, inventory audit, restock levels, minimum stock, lead time and more. Maintenance inventory software has numerous benefits associated with it. First of all, consolidating equipment maintenance data with inventory potentially makes all maintenance information accessible from one software solution. Secondly, managing maintenance inventory control procedures separately from other company inventory control procedures simplifies search and accounting for the maintenance budget. That being said, many organizations (small business and large multi-site corporations) use our inventory management software to manage all of their inventory, not just maintenance spares. Lastly, maintenance cost reporting becomes a simple and intuitive matter when maintenance spares acquisitions and spares usage reporting appears along side other maintenance expenses in the same reports. Built in physical inventory variance audit capability. Cycle-count audit and ABC analysis. Powerful and fast parts search. 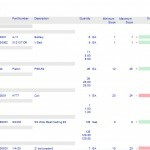 Minimum and maximum stock reports and alerts. Inter-plant transfer request and approval system. Equipment linked parts list and passive equipment link association. Many reports for stock levels, audit, over/under stock. Eight (8) open fields offer flexibility to adapt to your maintenance inventory management system. Manage your supply chain with our complete purchase order management and inventory requisition management system. Build purchase orders or requisitions from our interactive CMMS dashboard. The maintenance inventory software system has 26 useful reports for stock value, spares location, restocking lists and inventory item counts. These reports are important for decision-making and for tracking maintenance costs. 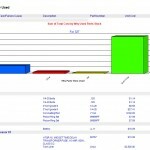 Similarly, the inventory report builder creates any report of any data with simple drag and drop. 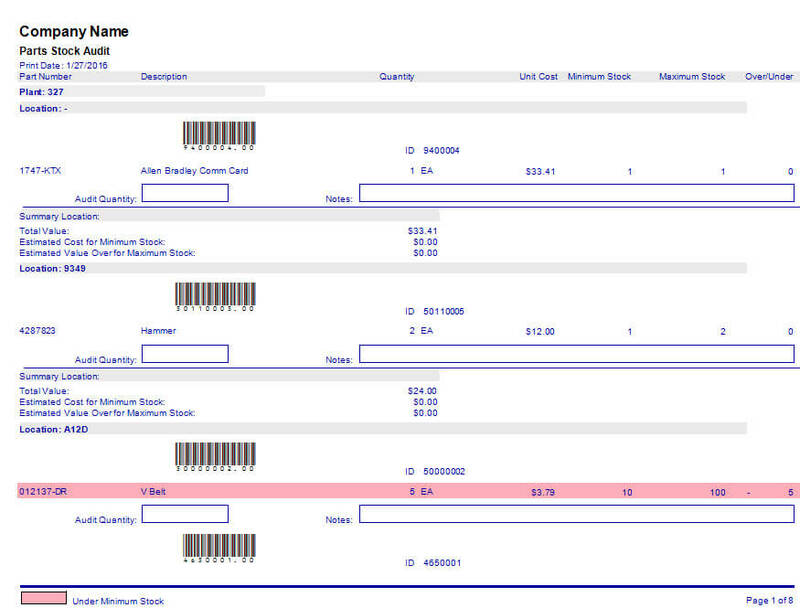 Many of the same reports available in the purchasing module are also available from the inventory management screen. Also, having restocking reports available from the inventory management system makes sense as these two facets of maintenance management are closely related and affect each other. Additionally, the inventory management system highlights items that are under stock. Searching for parts is very fast and utilizes three different search methods. Best of all, each column is searchable by type-search creating a flexible search capability as well. This is particularly important when it comes to very large spares inventories in some cases numbering in the tens of thousands of item. In short, our full featured inventory management software system and simplifies both the acquisition and usage of spares. Export all inventory to Excel with two button clicks. Similarly export directly to a new web page. No other maintenance inventory software has this ability. Indeed, having a flexible way to share data is important for users that may not have the CMMS installed or even have Microsoft Office. Numerous reports provide specific information about location, part group, vendor, restock levels and much more. 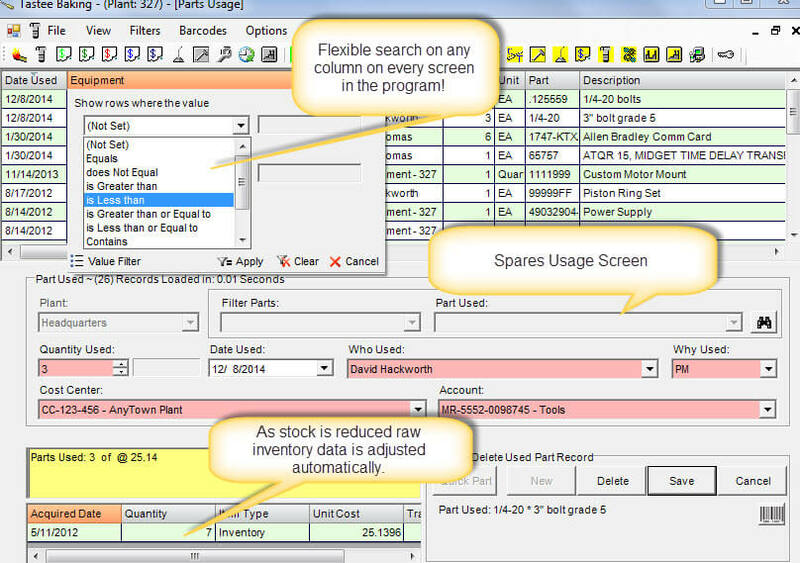 For example, spares location reports give the maintenance manager or parts room clerk immediate access to needed parts by grouping spare parts by each bin location or other designated location. Bar codes on inventory audit reports make performing a physical inventory variance audit simple and intuitive. 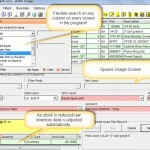 Log spares used for work orders, preventative maintenance, down time (or simply used on an equipment) into the maintenance inventory software database. Consequently generate detailed reports that specify exactly how much labor time and/or spares are used to maintain and repair this equipment. Additionally, these reports provide who, why and where information regarding the use of these spares. The inventory database decrements automatically as spares are used. Conversely, the spares database quantity automatically increments when unused spares are returned to stock. Best of all, spares usage costs are quantified against each equipment item. In short, this valuable information guides the maintenance planner with objective inventory management information leading to decreased costs and less downtime. Use either the built in physical inventory audit feature or the new cycle-count audit feature and ABC analysis coming in early 2016. Several spares usage reports inform the maintenance manager where, why and by whom parts are used. 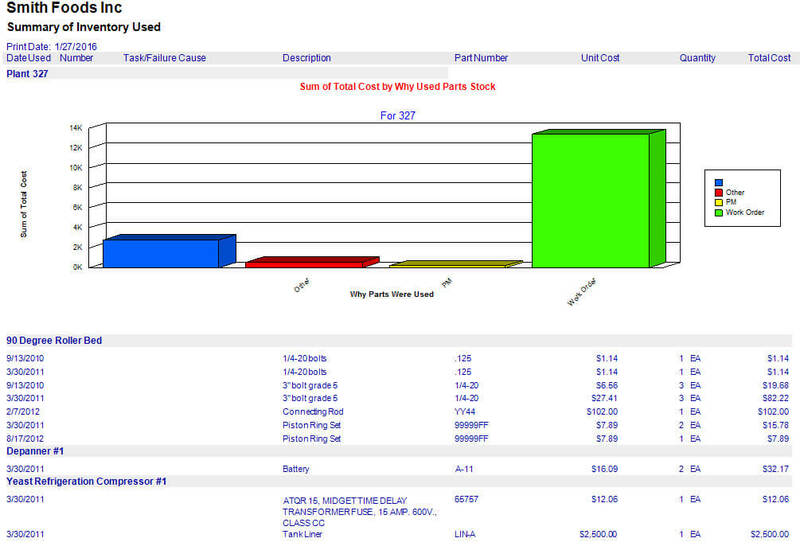 Additionally, Overall Equipment Cost reports display data roll-up reports of all equipment costs. 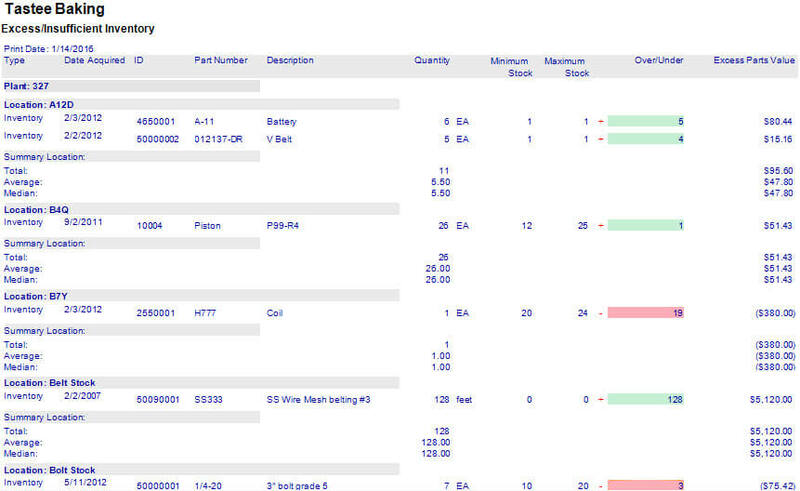 Use our inventory management software to track inventory levels, spares acquisition and spares use. Additionally, our maintenance inventory management system software provides for spare parts linking to work orders, equipment failures, preventive maintenance and more. Furthermore, parts usage linking can be automatic or manually linked. 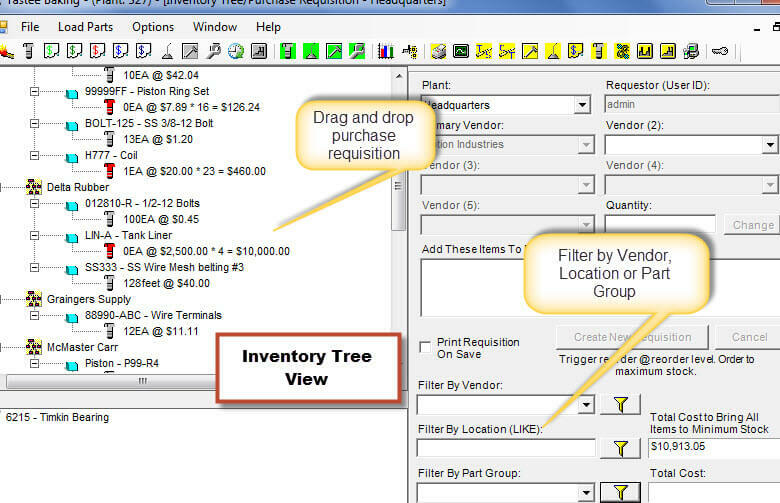 As such, use parts and the inventory management software automatically reduces inventory for you while linking the parts to the equipment item. Conversely, return parts (after use) by simply deleting the "parts usage" record or reducing the quantity used. 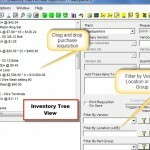 In this situation the software automatically adjusts your stock level in the inventory database. Needed spares (linked spares that is) do not have to be automatically used and can simply display on the preventative maintenance task list. For this reason, manual adjust of the raw inventory database is unnecessary except in the case where a performing a physical inventory audit. Several reports are available that provide to entire cost of owning equipment including parts used for equipment maintenance operations. Another useful feature related to this is the ability to see what parts were used in the past for a particular repair so that these same parts may be quickly identified and used when needed. Type search the grid column header. The part search screen provides up to nine filters including partial match. Filter by part group with part group drop-down box. Use the part grid column filter capability. Contact us for a personalized demonstration of each of the above methods or anything else you are interested in learning more about.